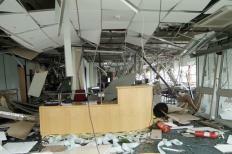 Business insurance can protect people from tornados. Business owners are often strongly advised to retain insurance for their own protection due to concerns about very high liability situations like personal injury suits. Business insurance is an insurance product with specific coverage for risks associated with doing business. A number of insurance companies offer this product, and can provide tailored insurance policies to meet specific needs by mixing and matching different kinds of coverage. Business owners are often strongly advised to retain insurance for their own protection, and in some cases, it is legally required due to concerns about very high liability situations like personal injury suits. Insurance involving business activities can include everything from freight insurance to protect shipments in transit to premises insurance so businesses where injuries could occur on site can be covered if the injured party sues. The amount of coverage varies, depending on the situation. Businesses may be advised to get high coverage if they are high risk, as in the case of a swimming pool where slips and falls are highly likely, and lower coverage may be suitable for a less dangerous environment, like a knitting store. The cost of business insurance is usually dependent on the industry, the insurance history of the business, and whether the business has taken any special steps to reduce liability. Insurance companies often offer reduced rates as an incentive to businesses who mandate safety courses for their employees or who exceed legally recommended safety precautions. Choosing a high deductible can also lower rates, as the insurance company will not need to pay out as much in the event of an incident. Business insurance can protect people from issues like income lost due to bad weather, malfunctioning computer systems, or construction. It can provide coverage for injured employees and customers, as well as covering losses, thefts, and damages in situations where the business was not acting negligently. Fire and flood insurance are common inclusions, and businesses may also consider earthquake or tornado insurance if they are in areas where these natural phenomena are known to occur. People considering business insurance may want to contact an insurance broker. A broker can assemble quotes from multiple insurance companies and provide the customer with a compare and contrast breakdown of the available business insurance coverage and the price points. Brokers may also be able to negotiate package deals with insurance companies, providing access to cheaper rates than businesses can get on their own. They also have ample experience in the industry, and can make recommendations about the amount of coverage a business should purchase, as well as any specialty coverage that might be advisable. How Do I Choose the Best Business Insurance Service? How Do I Choose the Best Business Insurance Policies? What are the Different Types of Captive Insurance? What is a Business Owner Policy?